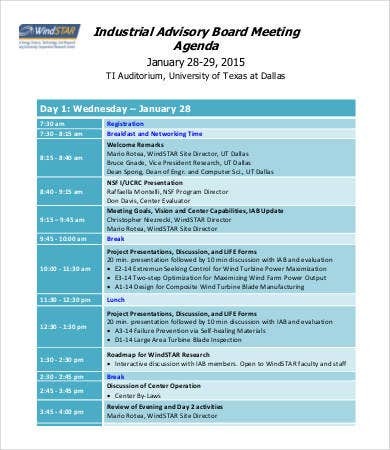 There are a lot of items that are being talked about in a board meeting as the steps to be followed and implemented for the coming operational days will mainly rely in whatever the attendees of this meeting agreed upon. 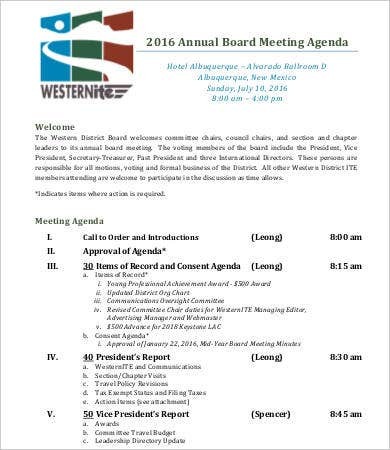 It is very essential for a board meeting to have an agenda as it allows all the attendees to focus on important matters and not veer away from the issues and processes that should be talked about. 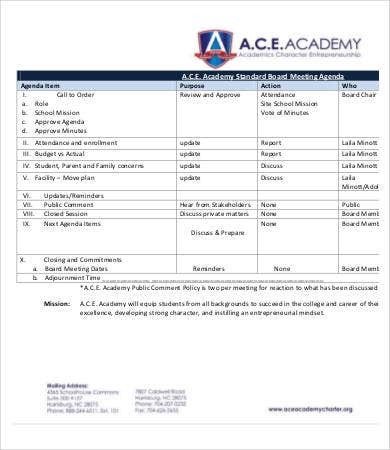 If you are to make a board meeting agenda or any other agenda in particular, you may use our Agenda Template as a reference in creating one. Reports from different departments must be talked about to know the current situation in all the aspects of the company’s operations. 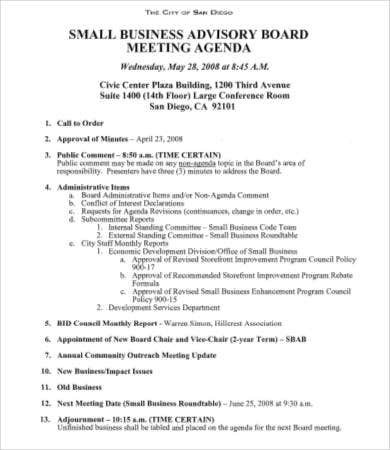 Unfinished businesses or the items that are left hanging in the past discussion must be updated and specific resolutions must either be done already or shall be implemented in the soonest possible time. There is also a need to talk about new businesses including achieving new objectives and goals and aligning developments to the vision and mission of the company. Funds management and other financial matters shall also be discussed to know whether the company is still profitable and bankable for new investments and growth. 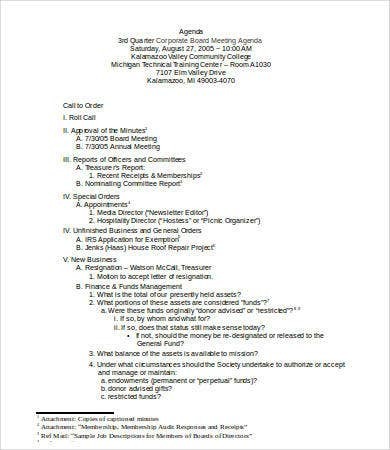 Aside from our board meeting agenda samples, you may also download our Budget Meeting Agenda Templates and Client Meeting Agenda Templates. 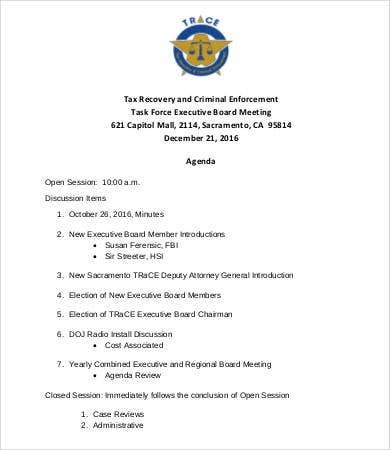 There may be questions and issues to be raised regarding a specific department so you must be there should your department or division be the focus of the issue. All the new processes and transactions will be talked about during a board meeting. You should always be knowledgeable with those so it is very important to attend scheduled talks regarding matters like these. Each division needs to report about their current standing as a team so that the need for improvement may be assessed and efficiency of all the people in the department will be assured. 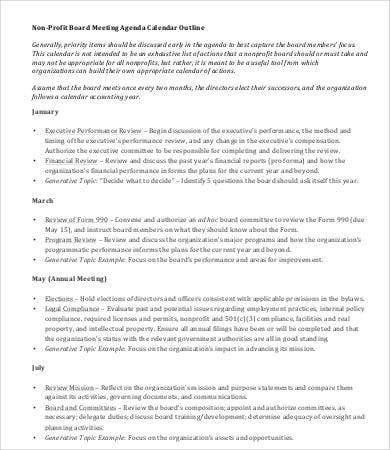 It is very important to have a board meeting agenda as it ends past issues accordingly, and it allows people to contribute ideas about a specific matter. It helps the company to be more collaborative and it makes creating steps and plans for the next processes to be done and well implemented. 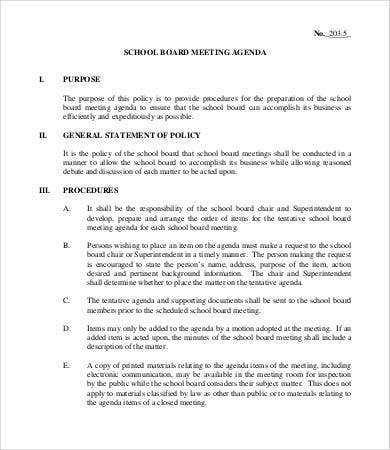 Having a board meeting agenda also allows the board members to talk about specific focus of interests hence making the meeting more productive. 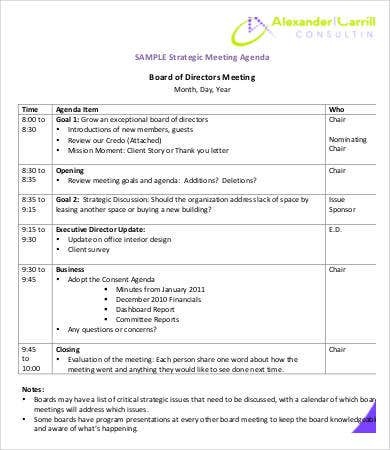 Aside from our board meeting agenda templates and samples, you may also download our Strategy Meeting Agenda Template for reference.